Initially, karate was used only for self-defense as the main form of hand-to-hand combat. At the present time it is a whole culture. 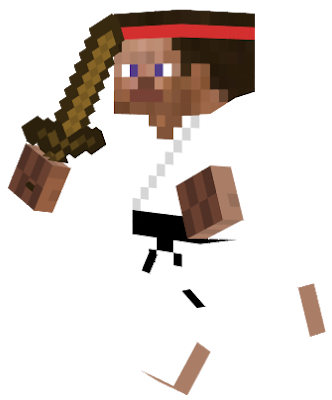 And if you have a desire to learn about it a little more, hurry to download the skin of the Karate Kid Skin for MCPE 1.2.9 and start playing in a new image. Mix business with pleasure. Not so often in MCPE it is possible to add something original, so unlike other familiar additions. With this skin, it’s cool to learn medieval maps, locations and authentic buildings. You can organize PVP competitions by inviting your friends or new acquaintances on popular servers. In general, there can be a lot of ideas for using such a skin. The main thing would be the desire! The skin looks amazing! White kimono, black belt, fashionable haircut – this is not all that can be seen by looking at the new hero. Fully skin will be revealed in the corresponding maps. On our resource there are many great additions and modifications that will reveal the full potential of such a skin. But still on the servers such a skin will be the most popular and popular. Hurry up to download the Karate Kid Skin into your game client and find out about your undiscovered features. Maybe even have to apply some techniques of popular hand-to-hand combat. But at the same time you will learn why karate is so respected in Japan and China. Almost every citizen of this country can tell everything about this sport. If karate can be called that. Before installing the skin, check what the game client Minecraft PE is installed on your mobile device.